Hey everyone! 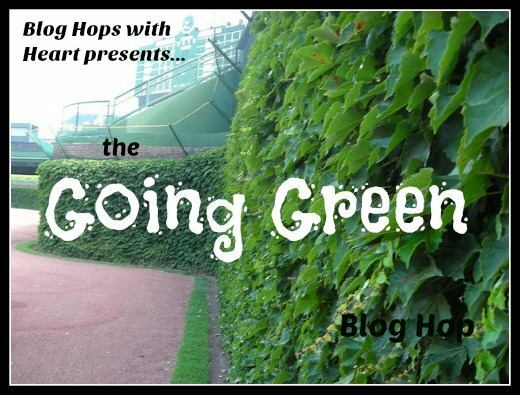 The Blog Hops with Heart are going green this month! 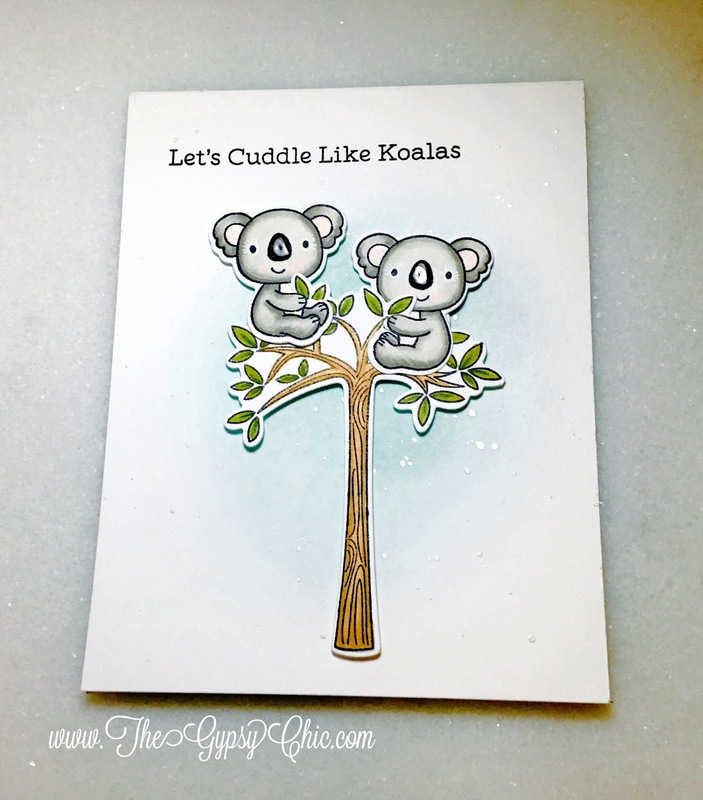 If you came from Shelly's Blog, you are in the right place! 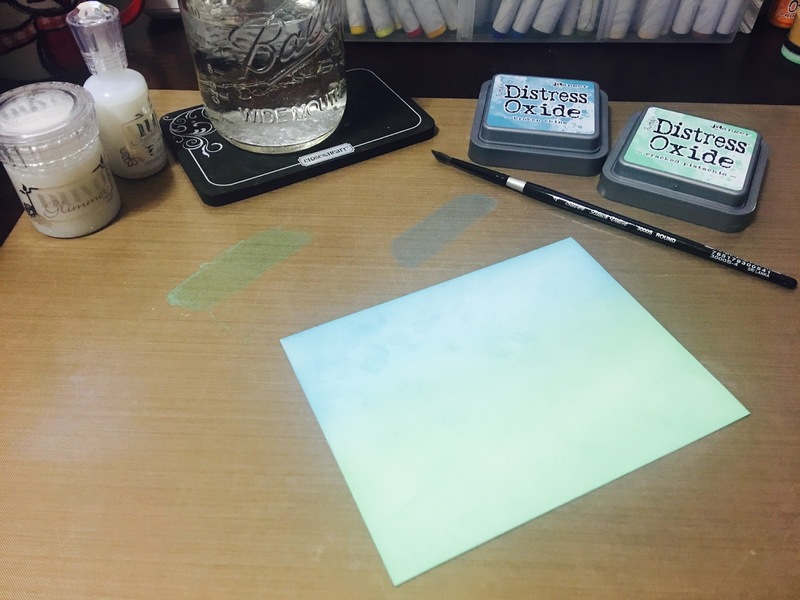 If you saw my last YouTube Video, you already know I picked up new Tim Holtz Distress Oxide Inks. I couldn't wait to play with them! Cracked Pistachio is one of my favorite colors, so I'm using it for my green today. To make my card, I started by blending out Cracked Pistachio and Broken China on Strathmore Bristol Smooth cardstock to make the background. When blending any inks into paper, what I hate most is getting my fingers messing and stained. Also when I touch the card to hold it in place, I accidentally remove some of the color. Sometimes I will use a post-it note to hold it in place...but today I couldn't find them anywhere...which led me to a new discovery! I have no idea why I didn't try this before, it worked perfectly! I simply flipped my CTMH All-Purpose Mat over, and used the sticky side to hold my paper. The CTMH All-Purpose Mat is the only craft mat I have found that is sticky on one side. So, it was great to have the mat hold my paper, and still be able clean up the mess with a quick wipe with a microfiber cloth. After blending my inks, I like to add splatters to finish the background. I wipe a bit of ink on the All-Purpose Mat and mix with water to splatter on my card panel. Then after they dry, I used Lawn Fawn Ocean Wave Border dies to cut my waves out, and popped them up with foam tape to simulate waves. 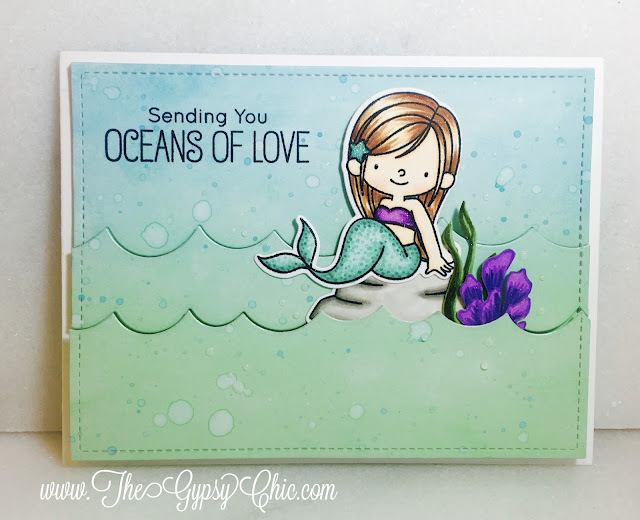 I colored the images from the MFT Mermazing with Copic marker and cut them out with MFT Mermazing Dies. (Don't forget to use the code MFT15 to save 15% at Hallmark Scrapbook!) I then used the Lawn Fawn Outside In Stitched Rectangle Dies and added Nuvo Crystal Drops to finish my card off. Next on the hop is Becca's Blog! Thanks so much for joining me!